Throughout my life, I have often considered churches as important to Catholicism only by their service as functional spaces for the celebration of Mass. However, spending time in Rome, the city of more than 900 churches, has endowed me with a new appreciation for the multitude of ways in which churches enhance an understanding of the Catholic faith. My first event in Rome was attending Mass at the Basilica of St. Paul Outside the Walls, a church known throughout the world for its antiquity and importance as one of Rome’s seven papal basilicas. Before Mass began, Dr. Dawson, our program director, paused to help us appreciate the significance of the building that we were entering. Dr. Dawson explained that early Christian churches, such as St. Paul’s, were designed to help people understand their relation to God, the world around them, and one another. Thus, a garden is placed in front of the church entrance to remind all who enter of the Garden of Eden and of the belief that union with God in heaven will be paradise, or a “New Eden.” The garden may often include a fountain to draw the mind to contemplation of the waters of baptism. The church itself is composed of a long central aisle, or nave. The nave, with its long walk from front door to altar, is a structural metaphor for life’s pilgrimage towards God. Finally, the nave culminates in the sanctuary, where the altar is located. The sanctuary is often furnished with frescoes or mosaics that depict God, Christ, angels, saints, and events from the Bible. This artwork is meant to communicate that the long walk of life culminates in a glorious union with the divine. This journey is supported by the witness of the prophets and saints who have successfully entered the Church Triumphant. 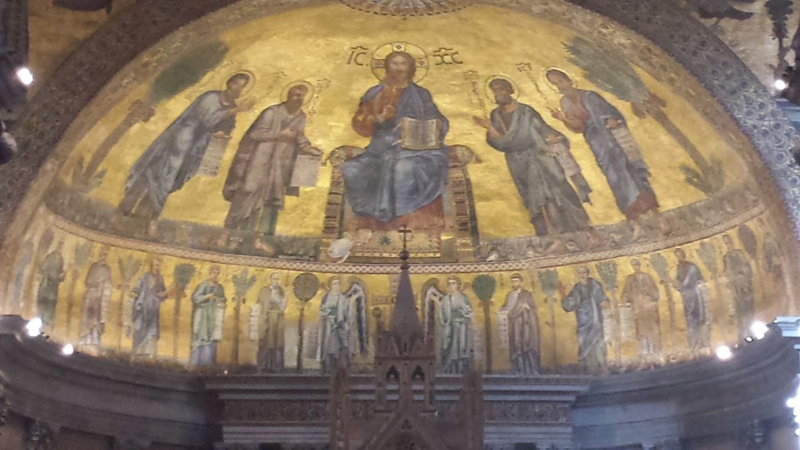 As Dr. Dawson concluded his introduction to the basilica, I stood in awe before the church in the middle of the garden, examining the golden mosaics on its exterior. I realized that my new ability to profoundly appreciate this particular church will similarly impact my understanding of all other churches that I will encounter in my future. Now, whenever I enter and explore a church during my wanderings throughout Rome, I am grateful for the many ways that I see the entire church as an affirmation of the Catholic faith, from its art to its architecture.